Figure 31.9. Overall survival stratified by κ/λ sFLC ratio. (Reproduced with permission from the British Journal of Haematology and John Wiley & Sons Ltd). Figure 31.10. Serial sFLC measurements in a case of MCL. Mantle cell lymphoma (MCL) accounts for around 3 - 6 % of all NHL. Although the disease demonstrates an initially encouraging response to treatment, its clinical course is usually marked by frequent relapses, with a median overall survival of only 4 - 5 years. Consequently, patients receive multiple lines of chemotherapy and are monitored closely for signs of disease relapse. Several groups have reported a relatively high incidence of κ/λ sFLC ratio abnormalities ranging from 36 to 77% . Furtado et al. characterised sFLCs in a cohort of 20 relapsed/refractory MCL patients enrolled into a clinical trial of single agent oral lenalidomide. At disease relapse, 8 of 20 (40%) MCL patients had elevated sFLCs concentrations (classed as monoclonal [7/20] or polyclonal [1/20]). Overall survival was significantly shorter in patients with abnormal sFLC ratios than in those with normal sFLC ratios (p=0.001, Figure 31.9). For patients with an elevated sFLC ratio at trial entry, a 35% rise in the sFLC ratio correlated with disease progression. Summated κ + λ sFLCs (ΣFLC) did not correlate with disease outcome. Furtado et al. also recorded serial sFLC measurements following lenalidomide treatment. 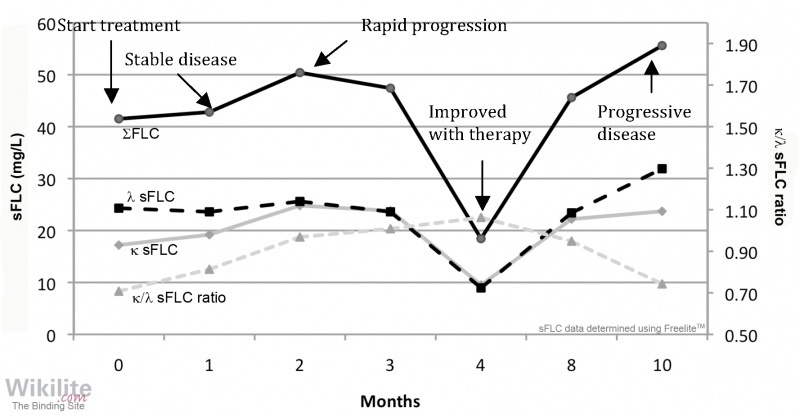 In five patients with monoclonal FLCs at disease relapse, normalisation of the sFLC ratio correlated with clinical improvement (reduction in lymph node size and/or resolution of ‘B’ symptoms). Of the patients with normal sFLC ratios at disease relapse, four individuals subsequently developed a polyclonal elevation of κ or λ sFLCs . In such cases, the κ/λ sFLC ratio remained uninformative, but ΣFLC correlated with disease behaviour (Figure 31.10). Use of the κ/λ sFLC ratio for monitoring response to treatment has been reported in other patients . What is the source of elevated polyclonal sFLCs in patients with lymphomas? What type of lymphoma is associated with the highest incidence of κ/λ sFLC ratio abnormalities? Why are sFLC measurements useful in DLBCL? The tumour itself, the immune response to the tumour, renal impairment, the systemic response to infection/inflammation or a combination of these factors. Mantle cell lymphoma (Section 31.4). When elevated, sFLCs identify patients with inferior event free survival and overall survival. sFLCs may also be useful for monitoring some cases of DLBCL (Section 31.3).